Marginal zone (MZ), follicular (FO), and B1 B cells form the long-lived naive B cell compartment. To identify surface markers that define MZ B cells in mice, we generated a panel of mAbs reactive with MZ but not FO B cells. One of these mAbs, MZ3, was found to recognize the tetraspanin CD9. CD9 expression not only distinguishes MZ B cells from FO B cells but also divided peritoneal cavity B1 cells into smaller subsets. After short-term in vitro stimulation with various mitogens, FO B cells failed to induce CD9 protein, while MZ B cells up-regulated the level of CD9 protein. However, after prolonged culture of FO B cells with LPS, surface CD9 was induced, together with syndecan 1, indicative of plasma cell differentiation. Following immunization with a T-independent-2 Ag, R36A, or a T-dependent Ag, SRBC, we found that CD9 is not expressed by germinal center B cells but is eventually expressed on plasma cells in response to both T-independent-2 and T-dependent Ags. Collectively, these results suggest that MZ B cells and B1 cell subsets are the immediate precursors of plasma cells in the primary response and that CD9 is acquired by T-dependent plasma cells. During the process of B cell development in bone marrow, naive B cells differentiate and migrate to different microenvironments so that peripheral lymphoid tissues contain mature B cell subsets with alternative phenotypes and functions (1, 2). Although the majority of B cells in spleen are located in the follicular (FO)3 area, B cells of slightly larger size, and expressing different levels of differentiation Ags, are present in the marginal zone (MZ) (3, 4). Studies with gene-targeted mice have shown that CD19, btk, pyk2, NF-κB, aiolos, DOCK2, and Lsc are required for the development of MZ B cells but do not appear to be as critical in the development of FO B cells (5, 6, 7, 8, 9, 10). MZ B cells also develop independently of T cells (11, 12). Additionally, transgenic (TG) mice expressing certain Ig H chains show clonal enrichment in the MZ B cell compartments (5). Together these data indicate that various genes modulate the selection of B cell subsets, and that the localization of FO and MZ B cells is mediated by B cell receptor signals, migratory signals, and other survival signals from dendritic cells or macrophages in the spleen (13, 14). MZ and FO B cells differ in functional capabilities in vitro as well as in vivo (15, 16). MZ B cells respond and proliferate more rapidly than FO B cells to a variety of stimuli, including LPS and anti-CD40. In addition, they are much more readily activated to differentiate into plasmablasts than are FO B cells (11). MZ B cells preferentially secrete Abs of IgM and IgG3 isotypes, while FO B cells preferentially secrete IgG1 or other Ig isotypes after stimulation, reflecting the role of MZ B cells in the primary T-independent (TI) response. The exposure of MZ B cells to blood, by their intimate association with the marginal sinus, enables MZ B cells to provide a rapid and early defense against blood-borne organisms (17, 18, 19). The B1 subset of B cells is localized preferentially in the peritoneal and pleural cavities, although minor populations of B1 cells are also found in spleen and lymph nodes (20). B1 cells are similar to MZ B cells with respect to expression patterns of CD23, IgM, and IgD and their ability to rapidly differentiate into plasma cells (21, 22, 23). However, they differ in expression of other surface markers such as CD5, CD1, and preferential IgA switching by B1 cells (24, 25). Phenotypically, MZ B cells have been distinguished from FO B cells by the differential expression of several surface markers. MZ B cells are CD23−/lowCD21highCD1highIgMhighIgDlow, while FO B cells are CD23highCD21intCD1intIgMintIgDhigh (1, 12, 16, 26, 27). Similarly, B1 cells are described as CD23−/lowIgMhighIgDlowIL-5R+CD43+CD5+B220low (20, 23, 28, 29). Until now, there have been no definitive surface markers that directly distinguish MZ B from FO B cells in mice. Such marker(s) would be useful in tracing the development and the functions of MZ B cells. With this in mind, we attempted to identify novel surface markers of MZ B cells by generating subset-specific mAbs. In the process, we generated a panel of mAbs specific to MZ B cells and showed that one of them, MZ3, recognizes the tetraspanin CD9 (30). CD9 is a cell surface glycoprotein belonging to the tetraspanin (TM4SF) family, which is characterized by four transmembrane-spanning domains and two extracellular domains. This family also includes CD37, CD53, CD63, CD81, CD82, and CD151 (31). Although its exact function is unknown, previous studies implicated CD9 in cell adhesion, migration, or signal transduction (32, 33, 34). Biochemical studies have shown that CD9 is physically associated with various membrane proteins such as integrins (preferentially β1 integrin), MHC class II, CD19, CD5, or other tetraspanin members, depending on the cell types (32, 35, 36, 37, 38, 39). Collectively, these studies show that CD9 may modulate the function of associated molecules. CD9 is expressed ubiquitously on a variety of hematopoietic cells, nerve, muscle, keratinocytes, fibroblasts, and ova (34, 35, 36, 37, 38, 39, 40, 41). CD9 is expressed on human pre-B cells (42); however, within the B cell lineage, CD9 expression on mature B cell subsets in mice has not been well addressed. In this report, we show that within the B cell lineage CD9 is a unique marker for MZ, B1, and plasma cells in mice. BALB/c, C57BL/6, CBA/CaN (xid), and CBA/CaJ (xid control) mice were purchased from The Jackson Laboratory (Bar Harbor, ME) or Charles River Breeding Laboratories (Wilmington, MA), and 8- to 12-wk-old female mice, unless stated differently, were used for analysis and cell sorting. All mice were bred and maintained in our facility at the University of Alabama (Birmingham, AL). VH81X-BALB/c H chain TG mice (BALB/c background) were previously derived in our laboratory (43). CD19-deficient mice (44) were generously provided by Dr. R. Carter (University of Alabama). A total of 106 FACS-sorted MZ B cells and FO B cells from a VH81X H chain TG mouse were repetitively injected s.c. into Fisher rats (The Jackson Laboratory) at 3-day intervals for 15 days. Popliteal and inguinal lymph nodes were dissected and fused with the murine plasmacytoma, P3 × 63Ag8.653, and dispensed into 96-well plates. At 14 days after fusion, hybridoma supernatants from each well were collected and tested on spleen B cells from BALB/c mice. The CH31 B cell line was surface-labeled with EZ-Link sulfo-NHS-LC-biotin as described by the manufacturer (Pierce, Rockford, IL). Briefly, 107 cells of biotin-labeled CH31 were lysed in 1 ml of 1% Nonidet P-40, 150 mM NaCl, 50 mM Tris (pH 7.5), plus a protease inhibitor mixture tablet (Boehringer Mannheim, Indianapolis, IN) and incubated overnight with protein G beads preabsorbed to either MZ3 or an isotype control (IgG2a, κ) mAb. The eluted samples were electrophoresed on 12% SDS-PAGE gel, transferred to nitrocellulose membrane, blotted with streptavidin (SA)-peroxidase (Southern Biotechnology Associates, Birmingham, AL), and developed with ECL reagent (Life Technologies, Rockville, MD). 293T cells transfected with a mouse CD9 cDNA plasmid were tested by flow cytometry for the surface expression of CD9 2 days after liposome transfection as described by the manufacturer (Promega, Madison, WI). Anti-CD9 mAb (KMC8; BD PharMingen, San Diego, CA) was used as a positive control mAb. Spleen and peritoneal cavity (PEC) cells were isolated from 8- to 12-wk-old female mice. Spleen cells were stained with FITC-anti-CD23, PE-anti-CD21, biotin-MZ3, and biotin-anti-CD9 (KMC8), while PEC cells were stained with FITC-anti-B220, PE-anti-CD5, and either biotin-MZ3 or biotin-anti-CD9 (KMC8) (BD PharMingen). SA-allophycocyanin (BD PharMingen) was used as the secondary developing agent for biotinylated Abs. Dead cells were excluded by propidium iodide staining. Cultured cells were blocked with anti-CD16/32 (FcR blocker; BD PharMingen) for 5 min and stained with anti-syndecan 1 (Synd1)-PE and either biotin-anti-CD9 or biotin isotype control Ab and then developed with SA-allophycocyanin. After LPS, LPS plus IL-4, or LPS plus IL-5 stimulation, the levels of bound CD21-PE or CD5-PE used for sorting were negligible. For cytoplasmic staining, cells were incubated with 1% paraformaldehyde in PBS overnight and permeabilized with 0.2% Tween 20 in PBS for 40 min (45). Cells were analyzed on a FACSCalibur flow cytometer (BD Biosciences, Mountain View, CA) and plotted by using WINMDI version 2.8 (The Scripps Institute, La Jolla, CA). Spleen cells were first depleted of T cells, dendritic cells, and macrophages by using magnetic beads coupled with anti-CD43, CD11b, and CD11c (AutoMACS; Miltenyi Biotec, Auburn, CA). The B cell-enriched preparation was stained by anti-CD23-FITC and anti-CD21-PE and sorted on a MoFlo cell sorter (Cytomation, Fort Collins, CO). Sorted MZ and FO B cells, at 5 × 105 (or 1 × 105) cells/ml, were stimulated in 96- or 24-well flat-bottom plates for 1, 3, and 5 days with anti-CD40 (HM40-3, 1 μg/ml; BD PharMingen), LPS (20 or 50 μg/ml; Sigma-Aldrich, St. Louis, MO), anti-IgM (10 μg/ml; Southern Biotechnology Associates), or IL-4 (100 U/ml), IL-5 (1 ng/ml; Sigma-Aldrich), or with combinations thereof. IL-4 was obtained from the supernatant of P3 × 63Ag8.653 cells transfected with the appropriate expression constructs as previously described (16). For PEC B1 cells, PEC cells were stained with anti-B220-FITC, anti-CD5-PE, and anti-CD9 (MZ3)-biotin, which was developed with SA-allophycocyanin. Purified CD9+ and CD9− B1a cells at 1 × 105 (or 0.25 × 105)/ml were stimulated with LPS or LPS plus IL-5. mRNA and cDNA analysis of sorted cells or cultured cells was performed by standard methods. Serial dilution of cDNA was used in a semiquantitative PCR assay. β-actin was used as a reference control. The primers used were as follows: CD9 (5′ primer CTCATGATGCTGGTTGGTTTCC and 3′ primer CTCTAGACCATTTCTCGGCTCC) and β-actin (5′ primer CCTAAGGCCAACCGTGAAAAG and 3′ primer TCTTCATGGTGCTAGGAGCCA). The amplification conditions were 94°C for 1 min, 57°C for 1 min, and 72°C for 1 min by 30 cycles after denaturation for 3 min at 94°C. The PCR products were electrophoresed on 0.8% agarose gels and the pictures were taken by Alpha Imager 2200 documentation and analysis system (Alpha Innotech, San Leandro, CA). Heat-killed Streptococcus pneumoniae, R36A, was prepared as previously described (46). A total of 108 R36A cells or 150 μl of packed SRBC (Vector Laboratories, Burlingame, CA) was injected i.v. into the tail vein of C57BL/6 mice. Of the panel of mAbs reactive with splenic B cell subsets, MZ3 reacted with the majority of MZ, but not FO, B cells (Fig. 1⇓A). The MZ3 epitope was also expressed on bone marrow myeloid cells, platelets, T cells, NK cells, and two mouse B1 cell lines, CH12 and CH31 (data not shown). Immunoprecipitation of the biotin surface-labeled CH31 B1 cell line with MZ3 mAb revealed a specific protein band of ∼26 kDa (Fig. 1⇓B), and MZ3 reacted with CD9 transfected T cells but not the parental 293T cells. These results showed that CD9 is a novel marker that distinguishes MZ B cells from FO B cells. CD9 is a marker distinguishing MZ B cells from FO B cells in mice. A, MZ3 mAb is specific for MZ B cells. The FACS profile is a representative of at least three BALB/c mice. B, MZ3 mAb specifically binds to a protein of ∼26 kDa from the CH31 B cell line by Western blotting. C, MZ3 mAb recognizes the tetraspanin CD9 in 293T cells transfected with CD9 cDNA by flow cytometry. KMC8 (anti-CD9 mAb) was used as a positive control mAb. 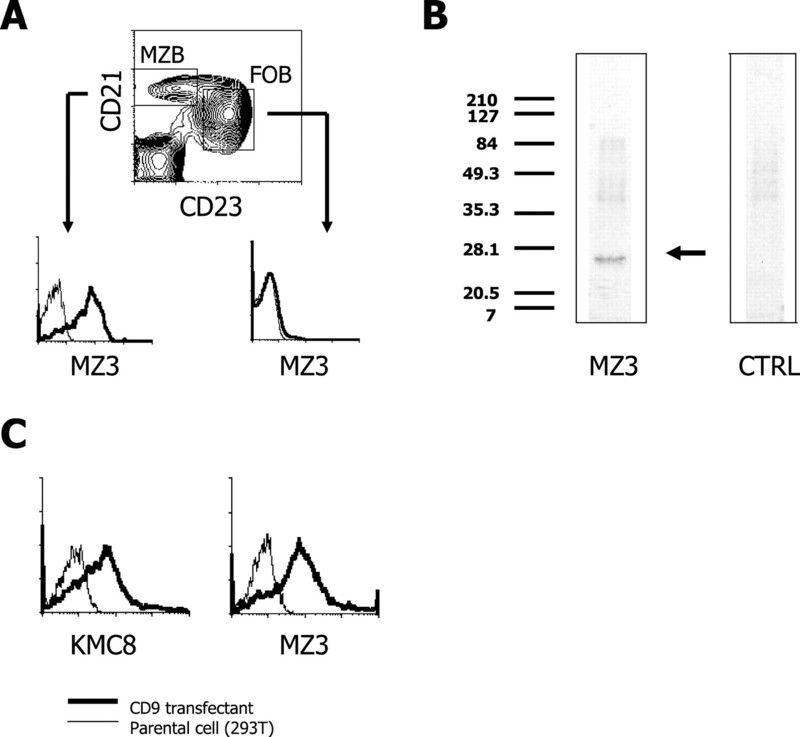 The majority of MZ B cells expressed CD9 in all mouse strains examined, although variable numbers of MZ B cells, as judged by high CD21 expression, expressed CD9 at low levels (Fig. 2⇓). As previously reported, CD19-deficient mice, with few MZ B cells (5, 12), had reduced CD9+ B cells compared with control mice (Fig. 2⇓B). It is of interest that in CBA/CaN (xid) mice B cells of the MZ phenotype are reduced slightly, but the majority do not express or have low levels of CD9 compared with control mice (Fig. 2⇓B). CD9 distinguishes MZ B cells from FO B cells in different mouse strains. A, BALB/c, C57BL/6, and VH81X-BALB/c H chain TG mice were examined. B, CD19−/−, CBA/CaN (xid), and control mice were examined together. 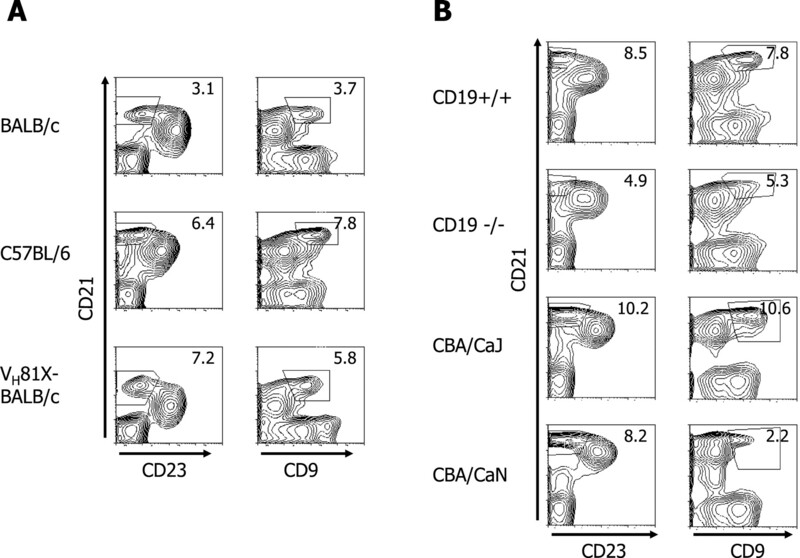 Each profile is of live lymphocytes and the numbers indicate the percentage of CD21highCD23− and CD21highCD9+ B cells in a representative profile from one of at least three mice, except VH81X TG mice, respectively. CD21highCD23−: BALB/c, 3.6 ± 1.1; C57BL/6, 8.3 ± 3.5; VH81X-BALB/c, 7.2 and 8.3; CD19+/+, 8.2 ± 1; CD19−/−, 4.8 ± 1.4; CBA/CaJ, 9.9 ± 2.3; CBA/CaN (xid), 7.2 ± 2.9. CD21highCD9+: BALB/c, 3.7 ± 0.9; C57BL/6, 8.6 ± 3.3; VH81X-BALB/c, 5.8 and 6.6; CD19+/+, 7.5 ± 0.6; CD19−/−, 5.2 ± 0.6; CBA/CaJ, 10.6 ± 1.9; CBA/CaN (xid), 1.8 ± 0.6. As PEC B1 cells are similar to MZ B cells in the expression of several surface markers, including CD23, IgM, and IgD (20, 29), the expression patterns of CD9 on PEC B1 cells were also examined. CD9 expression divided PEC B1 cells into two subsets in BALB/c mice. We also used Mac-1 to distinguish between B1b and B2 cells and confirmed that most B1b cells are Mac1+ (data not shown). The division by CD9 expression was similar between CD5+ B1a and CD5− B1a cells. However, this division was not consistent in C57BL/6 mice, where the majority of PEC B1 cells in C57BL/6 mice expressed CD9 (Fig. 3⇓). In C57BL/6 mice, a subset of B2 cells also expressed CD9. CD9 divides PEC B1 cells into subsets, which show strain dependence. The patterns of expression by PEC B cells were compared. 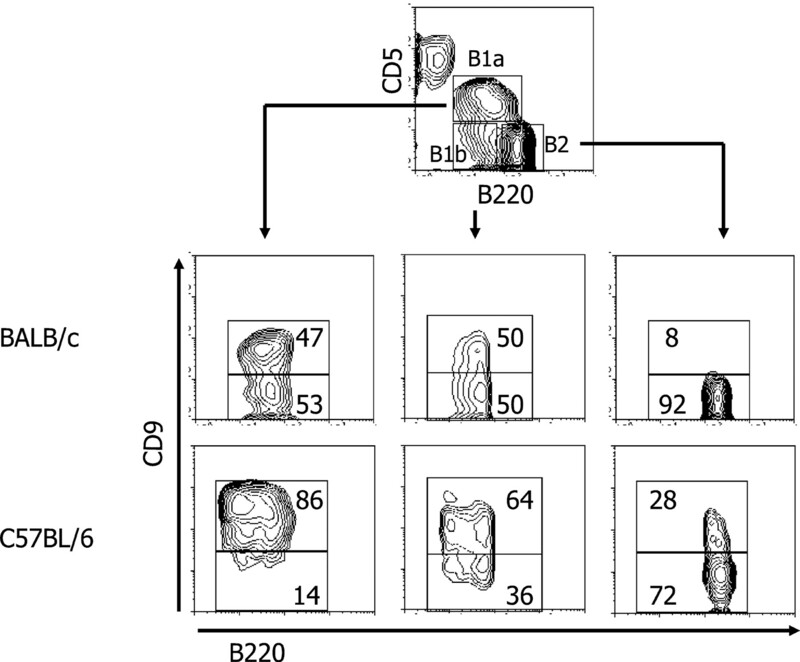 The numbers in each profile indicate the percentage of CD9+ and CD9− cells from gated B1a, B1b, and B2 populations in a representative of at least three mice. CD9+ B1a: BALB/c, 46.3 ± 11; C57BL/6, 87 ± 1. CD9− B1a: BALB/c, 53.7 ± 11; C57BL/6, 13 ± 1. CD9+ B1b: BALB/c, 48.3 ± 15.6; C57BL/6, 67 ± 1. CD9− B1b: BALB/c, 51.7 ± 15.6; C57BL/6, 37 ± 1. CD9+ B2: BALB/c, 7.3 ± 3.1; C57BL/6, 23 ± 5. CD9− B2: BALB/c, 92.7 ± 3.1; C57BL/6, 73 ± 5. In summary, apart from characteristic minor strain differences, the majority of CD23low/−CD21high MZ B cells express CD9 in normal mice. However, in mice with targeted or inherited gene defects there are dramatic alterations in CD9 expression by MZ B cells. To determine whether CD9 expression is controlled at the mRNA level, we compared levels of CD9 mRNA transcripts in freshly FACS-sorted MZ B and FO B cells by RT-PCR. As shown in Fig. 4⇓A, MZ B cells, but not FO B cells, clearly expressed CD9 transcripts. CD9 mRNA expression is consistent in both BALB/c and C57BL/6 mice. CD9 protein and mRNA are induced in FO B cells by LPS in late-term cultures. A, CD9 RNA transcripts can be detected in FACS-purified MZ B cells but not FO B cells. A total of 3 × 105 MZ B and FO B cells were used for cDNA preparation and RT-PCR products were obtained after 30 cycles. B, Late induction of CD9 transcripts and CD9 protein in FO B cells (5 × 105/ml). After LPS stimulation, the induction of surface CD9 and mRNA transcripts was examined at 1, 3, and 5 days. C, CD9 is up-regulated from resting levels on MZ B cells by LPS (20 μg/ml) at days 1 and 3. D, The frequency of cells coexpressing CD9 and Synd1 by LPS in FO B cell cultures is increased at low densities (1 × 105 cells/ml). E, Surface CD9 and Synd1 are induced on cytoplasmic IgG1 isotype-switched plasma cells generated from FO B cells in low-density culture (0.25 × 105 cells/ml). Thick lines and thin lines indicate staining of anti-CD9 and isotype control Ab, respectively. To determine whether CD9 could be induced or up-regulated in mature B subsets, MZ B and FO B cells were activated by LPS, anti-CD40, anti-IgM, and various cytokines, singly or in combinations (data not shown). As shown in Fig. 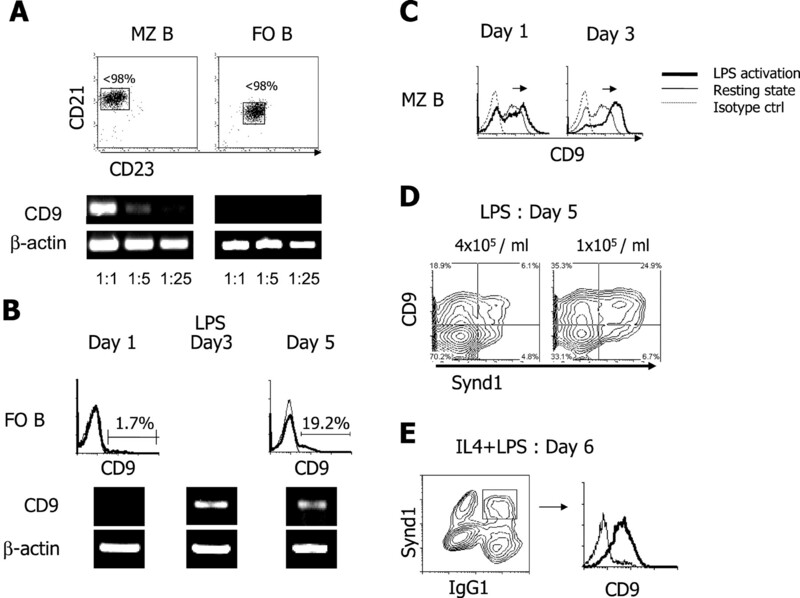 4⇑C, LPS caused MZ B cells to increase CD9 expression at days 1 and 3. In contrast, neither CD9 mRNA nor protein was induced in purified FO B cells by any stimulus at day 1. However, after day 3, a minor population of FO B cells began to express surface CD9. The appearance of CD9+ cells correlated with the detection of CD9 mRNA in the cultures. At day 5, the fraction of CD9+ cells increased to ∼20% (Fig. 4⇑B). These results show that CD9 is induced during the late stage of FO B cell differentiation into plasma cells. We also observed better induction of CD9 and Synd1 in low-density cultures (1 × 104/ml), where ∼60% of FO B cells expressed CD9 at day 5, and only 20% in high-density cultures (Fig. 4⇑, B and D). It appears that CD9 is expressed before synd1, depending on culture conditions, and then remains at the same level in Synd1+ cells (Fig. 4⇑D). Isotype-switched IgG1+Synd1+ cells were also generated from FO B cells by LPS plus IL-4 stimulation (47), and at day 6 these cells also expressed CD9 (Fig. 4⇑E). In summary, our results show that, although freshly isolated MZ B cells already express CD9 and FO B cells are CD9−, FO B cells express CD9 late after in vitro activation and then maintain the same level as they differentiate into Synd1+ plasma cells. This finding also holds for MZ B cells, which initially express CD9 and remain CD9+ at the Synd1+ plasma cell stage. Because FO B cells can become CD9+Synd1+ after stimulation in vitro, we next determined whether CD9 is also expressed on activated B cells and plasma cells in vivo. In unimmunized normal mice and CBA/CaJ control mice, the spontaneously generated IgM+ plasma cells all expressed CD9, but IgM+ plasma cells in CBA/CAN (xid) mice did not (Fig. 5⇓, A and B), and the frequency of plasma cells was less. We next examined two different types of induced plasma cells. Short-lived IgM+ and phosphoryl choline-specific plasma cells generated by immunization with the TI-2 Ag, heat-killed S. pneumoniae vaccine, R36A at day 3 expressed CD9 at levels similar to MZ B cells (Fig. 5⇓A) (5). Additionally, we used SRBC as an Ag to generate isotype-switched plasma cells, which were examined at days 3, 7, and 14 after immunization. As shown in Fig. 5⇓C, although germinal center (GC) B cells did not express CD9 at day 7, IgG1 and IgA isotype-switched as well as IgM plasma cells (data not shown) analyzed at the same time point were CD9+ (Fig. 5⇓C). CD9 is expressed on both early Ag-specific and late FO B-derived plasma cells, but not at the stage of GC B cells in vivo. C57BL/6 mice were injected i.v. with the TI-2 Ag, heat-killed S. pneumoniae (R36A), and T-dependent Ag, SRBC, and CD9 expression by plasma cells in spleen was examined at 3, 7, and 14 days. A, Unimmunized mice and mice injected with R36A bacteria were analyzed at day 3 for CD9 and Synd1 expression. B, Spontaneously generated plasma cells from xid mice were examined. 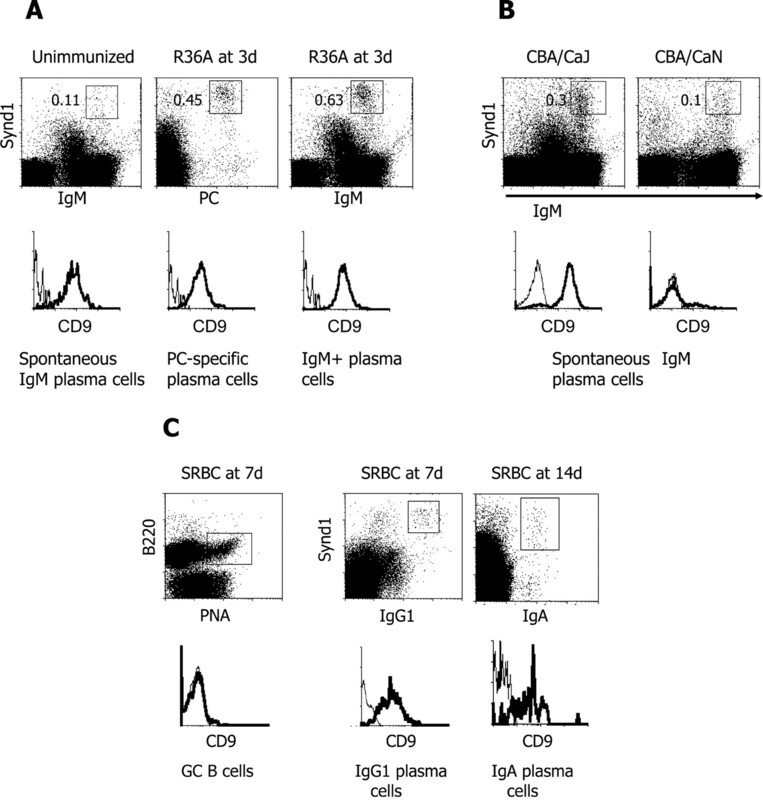 C, GC B cells and IgG1+ and IgA+ plasma cells were examined in spleen cells of SRBC-immunized mice at days 7 and 14. IgG1+ plasma cells were stained for intracytoplasmic IgG1. From these results, we conclude that, although CD9 is not expressed on GC B cells, both early waves of MZ and B1 IgM+ plasma cells and later isotype-switched FO B cell-derived plasmablasts become CD9+ as they differentiate to plasma cells. Therefore, CD9 is another marker for plasma cells. We next determined whether the division of B1 cells into two subsets by CD9 expression in BALB/c mice reflects functional differences. Because the number of B1b cells in BALB/c mice is low and, as a result, they are difficult to isolate, we divided PEC B1a cells into CD9+ and CD9− populations based on expression of B220, CD5, and CD9 (Fig. 6⇓A). Interestingly, we found that CD9 mRNA was also present in CD9− B1a cells, even though the level was much lower than CD9+ in B1a cells (Fig. 6⇓A). As in FO B cells, either IL-5 plus LPS or LPS stimulation (data not shown) also induced CD9 on CD9− B1a cells. However, the kinetics of CD9 up-regulation and plasma cell generation was much faster than for FO B cells and was comparable to MZ B cells. CD9+ B1a cells also produced plasma cells more rapidly and at a higher frequency than CD9− B1a cells (Fig. 6⇓B). Functional comparison between CD9+ and CD9− B1a cells in vitro. A, mRNA for CD9 is present in purified CD9− B1a cells. B, CD9+ B1a cells generate plasma cells more quickly and frequently than CD9− B1a cells. 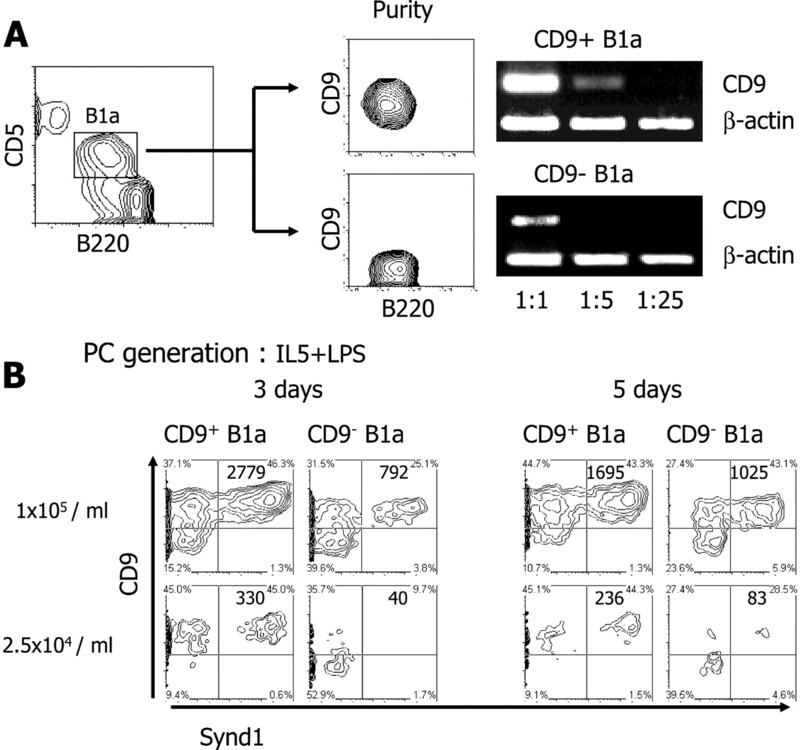 Equal numbers of purified CD9+ and CD9− B1a cells at different cell densities (1 × 105 or 0.25 × 105 cells/ml) were cultured with LPS (20 μg/ml) plus IL-5 and plasma cell (PC) generation by Synd1 expression was compared at days 3 and 5. Synd1 is not expressed on PEC B1a cells at the resting state (data not shown). The numbers in the upper right quadrant indicate the number of actual CD9+Syn1+ cells collected for 1 min at high speed and the percentage shows the proportion of each population out of total live cells. In summary, although the kinetics of plasma cell differentiation at early time points by CD9+ B1a cells is faster than from CD9− B1a cells, it appears that CD9− B1a cells also induce surface CD9 and catch up to CD9+ B1a cells at late stages. Until now, the delineation of splenic MZ B cells from other mature B cell populations in mice has been facilitated by the differential, but not absolute, expression of a constellation of markers, including CD1, CD21, CD23, IgM, and IgD. Previously, Oritani et al. (41) reported that CD9 was expressed on an unidentified subset of splenic B cells. We now show that CD9 is expressed largely by MZ B cells in the spleen and as such provides an important new marker for isolation and analysis of these cells. Multiple combinations of cytokines (IL-4, IL-5, IL-6, and IL-10), anti-IgM, anti-CD40, or LPS failed to induce CD9 expression on FO B cells in a short term. In contrast, MZ B cells rapidly up-regulated CD9 as early as 1 day after LPS or anti-CD40 treatment. However, after 3 days in culture, a minor population of FO B cells began to express surface CD9 with LPS or LPS plus cytokines. As expected, the frequency of CD9+ cells was much more increased in the low-density culture, as was the coexpression of Synd1, indicative of mature plasma cell formation. These results are in accord with previous findings, which showed that low-density LPS cultures favored B cell maturation and isotype switching (48). From these results, we conclude that CD9 is expressed on plasma cells derived from both MZ and late FO B cells in vitro as well as in vivo. However, CD9 is clearly not expressed on GC B cells in Peyer’s patches (data not shown) and in spleen of SRBC-immunized mice. Thus, CD9 is a late-appearing Ag in the T cell-dependent progression from GC B cells to mature plasma cells. This hypothesis is supported by the expression of CD9 on presumptively GC-derived isotype-switched IgG1 and IgA plasma cells. Previously, it was shown that human tonsil plasma cells also express CD9, but in mice the expression of CD9 on plasma cells has not been addressed (49). The fact that CD9 is expressed on both IgM+ and isotype-switched plasma cells makes it a useful new marker along with Synd1, CD43, and Ly6C for plasma cell analysis in mice. Detailed studies with this panel may lead to further phenotypic, functional division, and life span differences within plasmablast and mature plasma cell subsets (50, 51, 52). Recently, it was shown that mice deficient in the transcription factor XBP-1 generate very few plasma cells and are defective in Ab secretion. Although it is not known whether XBP-1 is expressed constitutively during plasma cell differentiation, it will be informative to examine the expression of CD9 on B cell subsets in these mice (53, 54). It is of interest that in xid mice MZ B cells (CD21highCD23−/low) were present, but there are only a few weakly CD9+ B cells. We also observed that spontaneous IgM+ plasma cells in unimmunized xid mice are approximately three times lower in frequency compared with control mice and also did not express CD9. It is known that xid mice contain an R28C mutation in the btk gene, have low levels of serum IgM and IgG3, and do not make TI-2 Ab responses. It appears that btk and CD9 may be involved in plasma cell differentiation during the primary humoral response (55, 56, 57). We show that CD9 is also a marker for B1 cells. However, the strain dependence of CD9 expression by PEC B1 cells is not clearly understood at this point. In addition, our results suggest that there are at least two functionally or developmentally distinct populations among B1 cells in BALB/c mice. Interestingly, CD9− B1 cells contain CD9 mRNA transcripts, although the level was much lower than in CD9+ B1 cells. The low levels of mRNA probably relate to the rapid induction of CD9− B1 cells during differentiation into plasma cells. As the kinetics of plasma cell generation by CD9+ B1a cells occurred more quickly and lead to a higher frequency of plasma cells than for CD9− B1a cells, it appears that CD9+ B1a cells are closer to a plasma cell stage than are CD9− B1a cells. This principle also applies to FO B cells, because we have shown that MZ B cells are more differentiated or activated toward plasma cells than FO B cells, as shown by the high resting levels of Blimp-1 transcription factor in MZ B cells (19, 54). The presence of the CD9− B1 cells in the PEC also suggests that in the B1 populations, which are chronically activated, there is a hierarchy of commitment to plasma cell and Ab production. Thus, the division of labor postulated for MZ and FO B cells may be further subdivided within each of these subsets and is reflective of further hierarchies of function and probable spatial compartmentalization. We acknowledge Dr. Paul Kincade for generously providing CD9 cDNA, Dr. Robert Carter for providing CD19−/− mice, Drs. Masuda Keiji and Flavius Martin for advice and help in experimental design, Dr. Larry Gartland for FACS sorting, Lisa Jia for technical assistance, Dr. Pete Burrows for critical reading of the manuscript, and Ann Brookshire for manuscript preparation. ↵1 This work has been supported in part by National Institutes of Health grants AI14782 and CA13148. ↵3 Abbreviations used in this paper: FO, follicular; MZ, marginal zone; TI, T independent; TG, transgenic; PEC, peritoneal cavity; SA, streptavidin; synd1, syndecan 1; GC, germinal center. Waldschmidt, T. J.. 1996. B-cell subpopulations and microenvironments. Cytokine Regulation of Humoral Immunity: Basic and Clinical Aspects 73 Wiley, New York.